Monster Compressor 2 is a device with a “right in your face character”. It was redesigned to complement the “soulless”, “super clean” digital technology and by adding color and life. The compression module evens the signal in a very pleasant and musical way, before the tube saturation. The unique combination of compression and tube saturation makes the sound seem distinctly closer, every detail stands out and gives the energy to the processed sound. It makes the sound more tactile and ear friendly. 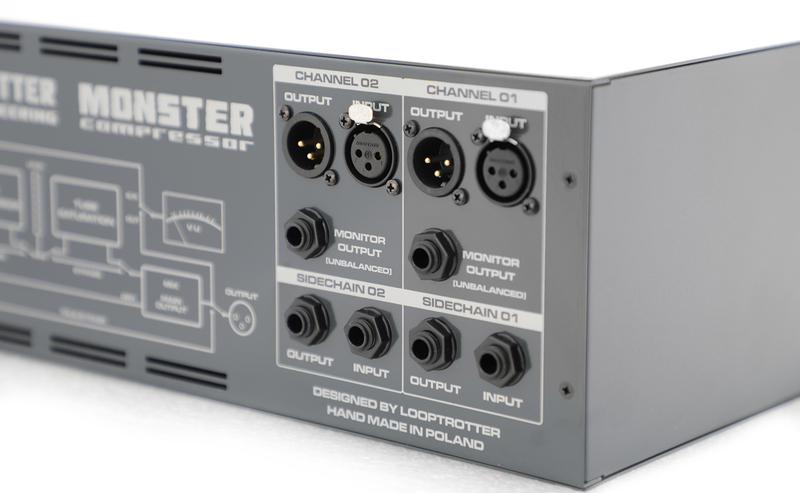 Monster Compressor 2 is built with the use of the best audiophile components of modern, analog technology. Within the highest quality, minimalistic signal path you will find integrated circuits, discreet circuits and electron tubes. The symmetrization and de-symmetrization circuits provide the neutrality of the sound, and those are based on integrated circuits dedicated to sound processing. The output of Monster Compressor is secured with capacitors also designed for sound. All parameters except the tube saturation are being controlled by switches made by Grayhill Electronics. Monster Compressor is a device with a “character”. It was designed to complement the “soulless”, “super clean” digital technology. The compression module evens the signal in a very musical way, before the tube saturation. The unique combination of compression and tube saturation makes the sound seem distinctly closer, every detail stand out and gives the energy to the processed sound. It makes the sound more tactile and ear friendly.